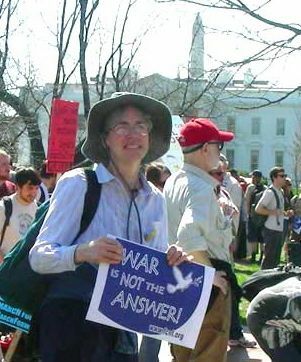 The slogan “War is Not the Answer” is occasionally spotted by alert bumper-sticker watchers. It is a nearly extinct species, especially in Red State America. Almost all sightings are in the small remainder of Blue States, or so it seems. The slogan’s shrinking habitat is a bad omen for the cause of peace. It’s a warning sign of war’s irrelevance. Few care, and fewer can imagine an alternative answer to war. Muravchik’s call to arms was true to form in its ritual projection of evil. Iran is “violent, rapacious, devious and redolent with hatred” for the United States. It is “akin to communist, fascist and Nazi regimes.” It aims to “carry its Islamic revolution across the Middle East and beyond.” It will do anything to get a nuclear weapon, including “cheating” on any deal that is made by the Obama administration. Only war will do the trick against such an enemy. The US can strike as often as necessary if Iran tries to rebuild its nuclear program. Iran might strike back at the US, but the US can always escalate the war against Iran as needed. Absorbing some Iranian strikes against the US is “the price of averting the heavier losses that we and others would suffer in the larger Middle Eastern conflagration that is the likely outcome of Iran’s drive for the bomb.” Iran has made the world a much more dangerous place. Sure, there is always someone out of step with the rites of war rhetoric. Someone like Ali Gharib can complain to readers of the Nation that Muravchik made “The Worst Case for War with Iran You’ll Ever Read in a Major Newspaper.” He can refute the particulars of Muravchik’s argument. He can label Muravchik a “neoconservative archetype.” He can report that Muravchik has been pushing for war aggressively since 9/11, including the invasion of Iraq, and making periodic calls for war with Iran since 2006. Gharib can insist that war is supposed to be the last option, not “probably our best option.” And so on. But it doesn’t matter that Gharib refutes Muravchik’s ritualized rallying call. No one cares. Okay, someone somewhere does care. But for the most part, issues of war and peace are not politically salient in the contemporary US. Nan Levinson points out in her “America’s New Military Mystique” that 95% of Americans are unaffected by what the military does, “especially in distant lands.” It is “just a blip on the busy-busy screen of our consciousness.” American Sniper is good entertainment—nothing less, nothing more. Americans are hypothetically war weary but they are also ready to have their professional military attack the Islamic State. It is easy to valorize the military “when you have nothing to do with it” and you don’t have to worry that you or yours will be drafted. It does not matter how high a percentage of the public opposes or supports war. High numbers and low salience do not a significant attitude make. In the meantime, the double negative translates into war being the answer by default.